Notes: Original title: Contributi alla critica armata libertaria, January 1980, ‘Nuovi contributi per una rivoluzione anarchica’ – 17. Excerpts first published in English in Insurrection 1983. Translated by Jean Weir. Strange as it may seem, that is exactly the point. The experience of AR, discussed at length in these old pages, demonstrates how an organization born with anarchist intentions, gradually became addressed towards a consideration of itself as the first objective to guarantee and increase, if not maintain and safeguard at any cost. From the actions, which contained revolutionary meaning and content, they address themselves — as the dispassionate reader can see for themselves — towards a theoretical rumination that can only lead to a precautionary justification for existing. Never as today, as a new season of insurrectional struggles is setting off, does this problem of organization and the risk of unrestrained self-reference need to be faced in no uncertain terms. The generalization of the clash does not admit privileged levels, nor is it to be blindly delivered to improvisation and spontaneity. Look around. From the daily clash we will have to pass, sooner or later — better sooner than later — to a more detailed and coherent insurrectional project, capable of involving others and not only demonstrating how determined we are. The enemy is getting ready, are we? Scrolling through these documents we see Azione Rivoluzionarias attempt, with characteristics that could be summed up as anarchist positions, to counteract the project of the Stalinist and Marxist-Leninist front of the various armed organizations active in Italy with the critique of arms, emerge with greater clarity and precision. The class analysis, the function of the armed organization, the objectives to be achieved, the relationship with mass work, are elements that make it possible to trace the differences between Azione Rivoluzionaria and the other armed organizations, while bringing out important contradictions with the general principles of anarchism and the practice of autonomous struggles that have been going on for several years. The most important of these contradictions is that of the function of the armed organization which persists in seeing itself as having a ‘guiding’, ‘primary’ function, towards mass work in the conditions of production and exploitation. It would have been more accurate to have talked about the indispensability of the specific armed organization and the simultaneous importance of the extension of mass work, without the one being subordinated to the other or vice versa. It does not seem right to infer from the fact that ‘comrades are moving in very dirty water’, once ‘they insert themselves within the supporting structures of capital’, that mass work be subordinated to clandestine armed intervention, as it is necessary in order to allow the development of revolutionary nucleuses within the productive reality. We believe, on the contrary, that mass work can be further developed, always within the productive realities and guaranteeing an appropriate contact with the outside, which would render the task of the specific armed organization of attack and defence against power more significant. With the publication of these documents we are taking the opportunity to open a debate among comrades included in the different realities of struggle, in order to better clarify the relationship that could exist between armed organization and mass work. With the attack on the main offices of Paoline Editions, representatives of the cultural wing of the Vatican linked to the CIA and the American multinationals, the revolutionary feminist and proletarian forces have struck one of the centres of their millenarian oppression. The generalized attack against the proletariat by the capitalist forces has also expressed itself through a return to ultra-repressive moralism propagated in the texts published by Paoline Editions. As well as the successful parliamentary clerical-fascist manoeuvre of confirming abortion as a crime and thereby incrementing clandestine abortions with which the barons of bourgeois and anti-feminist medicine are enriching themselves further at the cost of thousands and thousands of women, the feminist revolutionary forces are replying with the propaganda and support of armed struggle for their liberation. Free abortion is a political objective which the female popular masses have inserted in the ambit of a far wider revolutionary aim: the liberation of the popular masses. The condition of total subordination women are subjected to is fruit of a society in which essential structural values are power and profit in the fullest sense of the term. Sexist discrimination is racial and classist discrimination and this in turn acts on the popular masses in a comprehensive and total way. Women, blacks, prostitutes, homosexuals, proletarians and prisoners are our political allies. The parliamentary norm which regulates abortion is a squalid spectacle by the boss and social-reformist clique who act through the legalitarian parties. With the approval of articles 2 and 5 the woman does not have the right to manage her own body and her life autonomously. With the introduction of shoddy amendments, the substance of this liberticidal law has not been touched in the slightest. Article 5 bis, in fact, widens womens responsibility, but self-determination is denied and it is up to the doctor to decide whether the woman should or should not have an abortion. Therefore, legal and political confusions are provocatively created. Self-responsibility does not mean self-determination. The legislative meaning of self-responsibility consists of a subtle repressive manoeuvre where the woman becomes policeman of herself. The doctor-policeman will have to investigate an economic and social field absolutely unrelated to his presumed health authority. Here then the doctor, made into public official, becomes a link in the repressive chain of the police State. The speed with which the problem of abortion has emerged at a political, cultural, social level is not attributable to the greater concern of the political power centres, but to the decisive, conscious, combative position taken by the female masses and feminist autonomy that forced and had an effect in an extremely volatile manner on the acquiescent, apathetic, reactionary patriarchal policy. It is the women who have given the alarm to the closed bigoted world of the party sections and commissions, provoking and highlighting the turbid power intrigues found in opportunistic alliances between bourgeois parties, always ready to unite in front of the revolutionary “danger”, using the weapon of fascist dictatorship. The DC-PSI-MSI (Christian Democrats, Socialists, Fascists) alliance should be seen in this optic, aimed at denying the political, psychological and physical self-determination of women. The depersonalisation operated by the profit system and power structures have now reached nazi level: women, the popular masses, have been robbed of the ultimate, inalienable property: their bodies. We have closed a den that rakes in its profits from the sweat of the imprisoned proletariat. revolutionary joy. This May 5 1977 will remain a fundamental date for the revolutionary movement, because one of its vanguards has been able to give a precise indication of struggle. The action carried out by the comrades who struck Mammoli is not an episode of stupid revenge as some journalists have tried to make out, but is full of political significance. Mammoli could have saved Franco after the police beating and did not do so based on a cynical political calculation, a precise class choice, reconfirming once again in this case his behaviour on many other occasions towards imprisoned comrades (in the prisons there was great rejoicing when the news that he had been struck reached them). Mammoli is not only the doctor who through negligence left Franco agonizing for 32 hours while drop after drop his blood filled his cranial cavities until it crushed his brain. Mammoli is a symbol, an institution, a link in the prison system and his behaviour does not differ from that of other doctors in Italian prison who file away the death of a comrade with a few words. The figure and behaviour of Mammoli bring to mind many other squalid characters: the director of the prison in Pisa who tried to bury Franco in a hurry; the progressive magistrate Sellaroli who questioned Franco supported by two cops and did not bother to let him go to hospital; the great inquisitor Calamari who invoked the inquiry to cover it up; the captain of P.S. Albini who arrested Franco after ordering the lynching; the judge Angelo Nicastro who acquitted Mammoli. We do not allow ourselves to be misled by these names, it is not only on them that our attention must dwell, because there are hundreds of Mammolis, Calamaris, graduated police and magistrates in Italy, as cynical and determined as they are: and this gloomy mosaic is the grim image of the State. PISA — Franco Serantini, born in Cagliari, July 16 1951, is lynched by 10 police officers under orders of Captain Albini. He is arrested by Commissaire Pironomonte and Captain Albini and taken to Don Bosco prison. Serantini is interrogated in prison by sub procurator Sellaroli. Prison doctor Alberto Mammoli examines Serantini and writes: ‘Bruising right eyebrow; numerous contusions partly abrazed on the back, arms and lower legs; state of shock; Sympatol-Cortigen ice bag permanently in situ’. After 32 hours of agony, of atrocious suffering, anarchist comrade Franco Serantini dies. The certificate written by Dr Alberto Mammoli speaks of a ‘cerebral haemorrage’. An attempt is made to make his body disappear in fret and fury. Director of Don Bosco prison sends an employee with a death certificate to the Town Hall to ask for permission to have Franco buried. The employee on duty refuses to sign the authorization. At 17.30 the prison direction solicits authorisation. The ‘Governor of Toscana’ General Procurator of the Republic Mario Calamari advocates the judicial inquest to himself and magistrate Sellaroli takes care to formalize the trial to prevent the transfer of the inquest to Florence. Instructing judge of Democratic Judiciary, Paolo Funaioli deposits the sentence which follows his investigations. There are dozens of parliamentary interpellations and interrogation. Someone sues. The newspaper articles and Left reviews are the democratic cover of the system. The instructing judge Paolo Funaioli, downgraded at Calamari for his inquest which could lead to putting responsibility on the prison doctor, Dr Mammoli, and Captain of the P.S. Albini, is transferred from the penal to the civil law tribunal. The medical-legal report is deposited while the conflict continues between Calamari and the Pisa judges. Dr Alberto Mammoli, Pisa prison doctor, is sent to trial for culpable homicide. In the meantime the Commissaire Pironomonte resigns from the police because he has become disgusted by his work as hangman, but he does not supply the names of the police who massacred Franco. The High Court Council turns down Calamaris proposal and confirms judge Funaioli in his post. The General Prosecutor asks instructing judge Funaioli to acquit the pigs ‘as they remain unknown’ and Dr Mammoli because ‘the deed does not constitute a crime’. After a whole series of conflicts between Calamari and Funaioli, the judge asks for Captain Albini to be tried for ‘giving false evidence’ and other officers for concealing the names of Francos slaughterers. Judge Funaioli ‘spontaneously’ asks to resign. Judge Angelo Nicastro takes his place. Judge Angelo Nicastro concords with Calamari in deciding not to continue proceedings against Dr Mammoli ‘for not having committed the deed’ and limits himself to sending Captain Albini and the police guard Colantoni to trial for false witnessing. The magistrates court sentences the two pigs to six months suspended sentence. Appeal trial of Captain Albini and the guard Colantoni where they are acquitted. After the sentence of bourgeois justice, the proletarian one has arrived. [Dr Mammoli was injured with 3 gunshots in Pisa]. Justice has taken its course. ‘The Serantini case seemed to be closed’, writes Paese Sera. Franco Serantini was lynched by police in 1972 and left agonising till death by Dr Mammoli because he was guilty of anti-fascism. Mammoli has not been eliminated because others are just as guilty as he is, but he is politically, humanly and professionally corresponsible for the assassination of the anarchist Franco Serantini. This behaviour does not differ from that of other doctors in Italian prisons. During the night groups of comrades have more or less symbolically struck a series of objectives which represent ‘clean work’: above all the employment office, certainly a marginal instrument in the market of capitalist labour, but which symbolizes the bosses and reformists will to ‘employ’ us in any way whatsoever in the field of exploitation. At the Milan Opel we wanted to strike a part of that monstrous coagulation of German capital that is torturing and destroying our comrades in West Germany. We are the Azione Rivoluzionaria groups for the abolition of waged labour. Today, July 17 1977, the construction of the new ‘model prisons’ has been struck and sabotaged. True concentration camps (tombs for the living where prisoners are completely annihilated), struck contemporaneously in Florence and Livorno, cities where the technical-operative action was possible. The precise intent was to single out, denounce and combat the criminal project of capitalist restructuring which resolves class antagonism through the annihilation of proletarians, revolutionaries and opposers to its homicidal plans. The comrades reaffirm the unity of the class movement in solidarity and resistance with the proletariat who have been round up by capital and the State. Against capitalist reorganization, against detention-extermination. Freedom for the comrade prisoners. Here Azione Rivoluzionaria, we are claiming the night bombing of the headquarters of the IPCA in Cirie. Between 17 and 18 September 1977, the armed nucleus of AR ‘Rico and Attilio’ struck the headquarters of ‘La Stampa’ in Turin and the journalist of ‘LUnita’ Nino Ferrero. A bomb intended to cause great damage to the structure without injuring the people there was left at the headquarters; the journalist of ‘LUnita’ was kneecapped. With these two armed interventions Azione Rivoluzionaria meant to sanction precise personal and collective responsibility concerning the management of the news relative to the deaths of our comrades Aldo Marin Pinones ‘Rico’ and Attilio Di Napoli, fallen while they in turn were preparing to strike the headquarters of the Fiat newspaper in the framework of a complexive action, unfortunately tragically interrupted. ‘Rico’ was a fighter for freedom and communism in his country of origin: Chile. He fought with all his might against Pinochets regime, paying in first person. Outside his country he took up arms once again, knowing that the proletarian class struggle does not know national boundaries. Rico fought in other South American countries, he fought in Italy against the Christian Democrat regime and the historic compromise to cite only a few of his actions — to mention only those that we have an interest in indicating — the destruction of the new prisons in Florence and Livorno and the explosion against the IPCA of Cirie. Attilio was a very generous comrade, very young, capable of choosing and deciding in the midst of a corrupt and mendacious world, conscious of having to overcome the dichotomy between thought and action, ready for anything with the sure instinct of young proletarians convinced that they have nothing to lose and everything to gain. Attilio participated in various actions distinguishing himself for his courage and revolutionary wisdom. ‘Rico’ and Attilio live in the memory of all revolutionaries. Other hands will take up the arms fallen from them in battle. Their slanderers appear for what they are: vile dogs in the pay of the security services. LONG LIVE COMBATANT CHILE. LONG LIVE PROLETARIAN INTERNATIONALISM. HONOUR TO THE COMRADES FALLEN IN STRUGGLE. LET US FOLLOW THE EXAMPLE OF MARA, LUCA, SERGIO, ANNAMARIA, ANTONIO, DI RICO, ATTILIO. We of Azione Rivoluzionaria placed the bomb at parco Ruffini to strike the anti-communist congress of tomorrow. Moreover, tell the ‘Unita’ journalist to remember what he wrote about the Chilean comrade and hell understand why we shot him. At 5 oclock on September 28 a nucleus of Azione Rivoluzionaria partially interrupted the urban transport and distributed a leaflet signed the Industrial Confederation. We wanted to draw the workers attention to the problem of torture and special prisons. Comrades will excuse us for having donned, but only for a moment, the foul clothing of the confederal secretaryship. The very thought that the trade union and party apparatus are sensitive to the problem of torture and the concentration camps is a serious and naive sin. If sometimes they have acted in these terms in the past, they have done it only instrumentally; once they are associated with power they soon exhaust their democratic characteristics to reveal the bloody face of power. Tomorrow they will not hesitate to shoot the workers, as they do today with the emarginated, killed like birds in the streets of Italy and as they do against the revolutionary comrades. ... Comrades, let us take our indications from the comrades imprisoned in Asinara. They write: ‘In the whole metropolitan area the anti-imperialist combatant prisoner is considered a hostage in the hands of the State which is tending to develop a double actin in his regard: on the one hand treatment aimed at the progressive destruction of his will, personality and political identity through isolation. On the other the propagandistic use of this as ‘deterrent’ towards the revolutionary movement and proletarian forces. To this ‘treatment of war’ the revolutionary movement is engaged over the whole metropolitan areas in replying with ‘acts of war’. Comrades, let us respond to the States attempt to annihilate us with just as many annihilation measures. The supporters of the hard line cannot believe that they can hide behind the shadow of General Della Chiesa, nor can the supporters of the soft line hide behind ‘the need for a political framework’. They will all fall, swept away by the ruins of the concentration camps. The secretaryship of the CGIL/CISL/UIL Federation is calling you to a day of struggle against the reactionary involution in this country. The Confederal Secretaryship cannot fail to denounce the dangers inherent in this process which has in fact led to the legalisation of torture against dissidents in Italy. The events of Puteano, Alcamo, Rome, among others, show how torture is becoming normal praxis against dissidents. Moreover, the unions cannot ignore what is going on inside the prisons. They cannot accept the distinction, Byzantine to say the least, between advanced punitive prisons and concentration camps such as the Asinara. In fact, when a prisoner is held in a cell for 22 hours out of 24 and the two hours recreation are spent in a cubicle covered by a metal net Vietnamese-style, does he find himself in a special or a punitive prison? If every protest is punished with beatings right to the limit of survival, what should we think? To continue to remain silent on this subject would mean to give our own endorsement to this reactionary involution whose supporters are unfortunately present within the Trade Union movement. In fact, to continue to deny the existence of political prisoners in Italy, as has been done by certain trades union leaders, means to support this process of liberticide, as well as to deny the evidence which is before us; if political prisoners do not exist, what sense is there therefore in a law that discriminates between common law and other prisoners and asks for special treatment for them? Through continuing to deny the evidence we will find ourselves part of a process which will destroy not only freedom but truth. COMRADE WORKERS, WE ARE ASKING YOU FOR A DAY OF STRUGGLE FOR THE ABOLITION OF TORTURE, SPECIAL PRISONS, TO CHECK THAT REACTIONARY TURN WHICH WANTS A SUBJECTED TRADE UNION MOVEMENT, INERT AS WELLAS BLIND AND OBTUSE. LET US UNMASK THE REACTIONARIES WHO ARE NESTING WITHIN THE TRADE UNION MOVEMENTAND WHO WANT ITS DEATH! LET US ISOLATE THE STRANGLERS OF DEMOCRACYAND POLITICAL DEBATE! LET US RENDER THE SPIES OF THE NEW STATE HARMLESS! We revolutionary militants of the combatant organization Azione Rivoluzionaria are addressing ourselves to all the comrades participating in the Bologna conference on Repression to point out a few things concerning the recent actions that we carried out in Turin, actions which have been meanly instrumentalised by the bourgeois press and hangers on. The first thing to clarify is Lotta Continua’s function as informer, a paper which finds itself in the hands of a few profiteers of the revolutionary good faith of a number of comrades who still believe in the function of their paper. The accusations that this rag has made against us are enough in themselves to qualify the whole conservative politics which the managing group of the organisation Lotta Continua intend to carry out over our comrades’ heads, paying no attention to the indications of struggle coming from the movement. Having called us ‘fascist’ because we gave a CP servant a lesson he deserved and because we bombed the largest newspaper of the industrial bosses, can no longer leave room for any doubt on the direction that Lotta Continua intend to give to the movement. The second element that we want to point out is that we combatant militants of Azione Rivoluzionaria are here together with you participating in the conference against repression, because we do not consider ourselves a ‘military party’ eradicated from the real struggle of the mass and communitarian moments of clarification. That is why we reject every attempt—no matter where it comes from—to make us pass for another version of the combatant parties which in fact are acting today in the reality of the Italian and international revolutionary movement. Our aim is to realize a combatant structure which is as open as possible towards the base, one which allows for the massive participation of the exploited, emarginated, the non-guaranteed and all those who want to attack the boss class and their servants without a military party filtering this base and taking over the direction of the struggles. This is our concept of armed struggle. Simple and not demagogic. Today armed struggle is not only a project but a reality, a reality that no servant of the CP or Lotta Continua can ever mystify. We have attacked the CP, against whom so many revolutionaries have reversed burning criticism in words, calling them one of the main sources of reaction. This can only seem to be a bold step forward in appearances. In fact we have done nothing more than realize what many comrades theorize. Future struggles will always be aimed at clarifying both the role of the reaction and the so-called parties of the left, and the no less reactionary role of whoever, disguising themselves as revolutionaries, intends to put a brake on the self-organization of the armed struggle of the exploited. Corriere della Sera is equipping itself to face the new run of Italian freedom. Freedom, the various directors which for some time have been alternating at the helm of this prestigious truth machine will say, is such a precious and rare value that it is worth protecting, even inside in bunker. We are launching an appeal to all the anarchist comrades gathered at this umpteenth congress, who are not yet sclerotized and prematurely aged by the continuous and tiring task of treading the scenes as actors or spectators of the assembly and congress representations and to the comrades who have not yet devolved all their spirit and their revolutionary energies to a practice that makes expectation and defence its main prerogatives. It is precisely here in Carrara, as in Venice (at the conference on technocracy), that they want to revive the old branches of confusion, incapacity and the static nature of the movement. One would like to see with clarity, understand with true ardour. But unfortunately knowing the now sad story of these conferences (useful only as practice for trombone players), we are sure that as soon as all comrades become aware of the certainty of having clarified or confirmed their ‘what to do’ in their minds, reality will again be changed so many times that obstinate certainty and conviction will come up against an insurmountable wall as a barrier. And then the comrades will fall back into confusion, listlessness and disappointment, or even worse others will insist on keeping their narrow outlook and we will hear, or rather we hear, talk about the union, anarcho-syndicalism: a very old mental outlook for the society and the reality of today and maybe, thinking about it a bit, not even all that revolutionary for that of yesterday (but how ... and Spain? Oh, yes! Spain ... but without the FAI?!?). Or again, of class struggle, mass organization: mental closure even more rotten and decrepit than the previous one, we would call it in medical pathology: ‘Marxist phagocytosis in an unconscious state of degenerate involution’. Comrades, let’s look to renew ourselves for once, to be in step with the times, or rather to pre-empt the times. How can we hope to be incisive if the methods of intervention, mostly trivial theoretical propaganda, are now so old and worn out that they reduce anarchists to a sterile and unproductive movement of opinion, capable of mobilizing itself either on a defensive terrain when the power launches its repressive arrows, (pointless remembering the Valpreda case in its particulars, or worse, the [Giovanni] Marini case with his: ‘Defending yourself from the fascists is not a crime, comrade Marini you will be released!’), or as ‘hangers-on’, not even alternative, of the stormy and obscene policy of the various ex-extraparliamentarians. Comrades, let’s leave the politics of slogans, models, what was done a hundred years ago: let’s try to be proactive. We are also extending this invitation to the comrades who accuse our strategy of being suicidal. Is it perhaps suicide to have abandoned the traditional anarchist groups’ practice without strategy and tactics who, disoriented by the evolution of events, do not know how to move to take up again so-called ‘propaganda by the deed’ as an example for generalizing direct action? Is it perhaps suicide to have identified in the antinuclear struggle, not just a form of battle in a specific sector, perhaps with ecological tints, but a precise struggle against power? And again is it suicide to destabilize the State in all its central or peripheral forms, ridiculing it, putting it in crisis and pushing it to show its true face, that of coercion and violence? We are anarchists, we have already said so, ours is a revolutionary organization in which the various groups have gathered at the local level, or from the meeting of various personal stories, on the basis of an affinity between the comrades’ various experiences and conceptions. Affinity groups that maintain their autonomy and freedom of action and in which the relations between comrades are not of pure efficiency but rather are characterized by a maximum of knowledge, intimacy and mutual trust. What we want is to bring about a destructive critique of the State, through the use of revolutionary violence, armed struggle, propaganda by the deed. We want to speed up the times and widen the internal front of the clash to achieve a destabilization of the State. We believe that the constructive, utopian critical presence is not a sufficient, even if necessary, condition if a negative critical presence, destructive of the processes in course does not develop parallel to it. 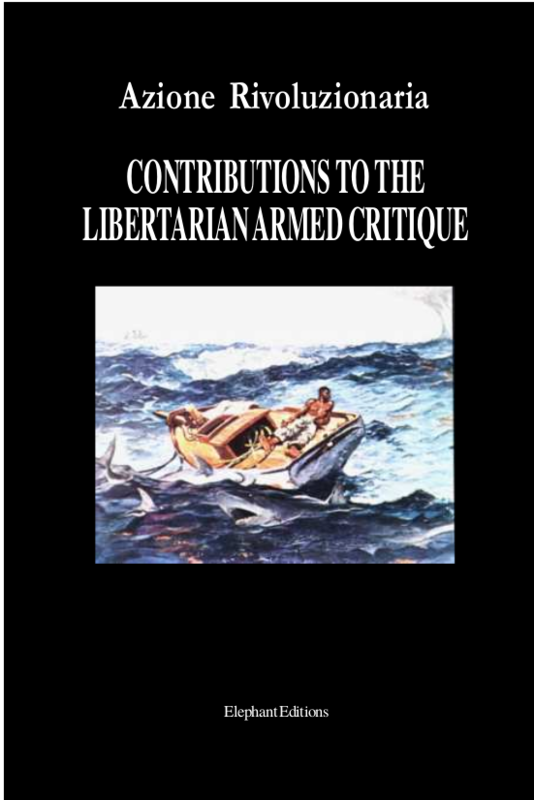 The critique of arms is the only force that can make any project credible at the present time. Here Azione Rivoluzionaria, we are claiming the bombing of the Banco di Roma head-quarters in via Cernaia, the Ferrari dealer in via Pinciana and the car showroom in via Palmiro Togliatti. During the night between the 18th and 19th June we struck the headquarters of the Christian Democrats in Aosta. This, as a warning, until they revoke the permission granted to the MSI to continue to speak in the squares of Aosta; because the DC is a symbol of speculation, exploitation, of which the Leone case is but an example. The DC wants us to come out into the streets to make us fight with the fascists and be massacred by the police. We will not allow other comrades to be killed in the streets and so we are using these weapons against the fascists and those who allow them to talk. This action is the demonstration of our strength and intention. It is just the beginning. LETS CREATE 10, 100, 1,000 ARMED NUCLEI. Here Azione Rivoluzionaria, nucleus of direct attack Rico and Attilio, we have struck the IBM multinational. We have struck the headquarters of Gazzetta del Popolo to remind all the regime’s hacks that hundreds of revolutionary comrades are dying in Italian prison-concentration camps. This action is in memory of all the comrades killed in actions against the State. Create ten, a hundred, a thousand armed nuclei.